ARE AKADEMI - Collegium Europaeum startpage: The 350 years anniversary celebrated in 2008 marked a milestone for the presence of the family-based tradition of the Areschovian academy once claimed to be among the oldest independent private academies in Nordic Europe. The verdant lily crown (an ancient icon of St Olof) flanked by roses (Rosencrantz) was contained in the emblem of Holger Arreskow (1634-87) from at least 1658, the year of the Scanian peace between Denmark and Sweden; it symbolizes an integration of nature with culture, of science with arts, and of trust with value. The icon signifies an epistemic culture embedded in the natural philosophy of that era and across the ages up to the present day. Today it stands for our work protecting the values of endangered treasures of culture and nature and developing the awareness of their roots in present society in view of future prospects. To view a few more suggestions about some historical currents leading us to the cultivation of the idea of a Nordic Academy, and about its sources, click the star: ( *). For an immediate access - bypass to contemporary activities (* ) and background (* ). A Nordic contribution of values to Europe would reflect its adoption of critical competence, conscient citizenship, a cultivation of constructive creativity in the science of arts and the art of science, and a conservation of the achievements of the historic heritage, on which we build our future: 'musicalization' of the human mind to serve as a pioneering intellectual compass in the world replacing fear with respect, ignorance with knowledge, and brutal power with insighful competence. Imagine society like an orchestra. If you want to play a symphony you should balance the mixture of dissonance and consonance. You will need a conductor. You will want a good music score by an exceptionally talented composer - a systemic legal framework to protect order in society - skilled and yet playful master musicians (or executives) with a sharp ear responsive to the competent interpreter and responsible to the context - and an audience sensitive to difference, capable of appreciating distinction, of experiencing emotions assimilated in the process and of converting its values into social maturity. A story in quest of what it is in culture that made man human, exploring the archaic roots of empathy as a generative algorithm across evolution; applying in practice the notion of human value to current society in view of a vision of a 'new arcadia'. in Arts and Sciences embedded in the context of Culture and History; envisioning for the benefit of Society and Industry a convergence of 'science as great art and arts as great science', and as the integer of wisdom, skill and taste, in live experience, by discovery in the intersection of tradition and progress. An interdisciplinary observatory for value-based research and knowledge integration; for the development of quality of performance in multimedia arts and sciences, for the societal quality-orientation of life, value of experience and of human health, industrial innovation and entrepreneurship: Exploring new venues to integrate European core values, cultivating "human capital" and improving social cohesion across disciplines and fields of enterprise - for the transfer of competence through dialogue in public and private arenas. An initiative to apply the benefits of crossing the generalist and the specialist dimension for the creation of sustainable excellence in performance. A necessary caveat: This is a laboratory of critical and constructive ideas in society that requires both transgressive competence and a creative mindset. This is not for the faint-hearted nor for the consensus populist. Before continuing make sure you have a grasp of what epistemic knowledge integration and metascience means. You might need to mobilize your personal experience framed in a broader mindset to follow the reasoning. Narrow-minded specialists decoupled from context beware. To qualify, a statement needs to be proven true not only in one discipline as in mainstream/basic science but we prefer to trust only the broader and deeper achored epistemic evidence from an intersection of multidisciplinary/crossfaculty perspective: this is critical and integrated science; while still incomplete, in flux and progress, it should always be open to questioning and falsification. We use a broad range of methods from both natural and social sciences, as well as from the arts and political science. This is why transdisciplinary dialogues are essential for us - and to bring it all together - for the epistemic status of top-level arts and sciences, upgraded as experiential evidence of cognitive life. For you, the portal also intends to progressively develop and provide a design for you to embark on to help you visualize your internal journey of learning and of potential self-realization. You will need to be well prepared to take full advantage of the inherent guidance provided to release a fruitful unfolding of a creative evolution - along an experiential path of gradual maturation leading you to enjoy the benefits and sustainable values of highly competitive self-insight. This is also the story about the synergy and pain of state of the art (world-leading coordinative and symphonic) competence applied to the ignorant chaos of systemic dysfunction so often encountered in many facets of this world. Paraphrasing the words of Sergiu Celibidache, it requires the mobilization of enormous amounts of energy to overcome the inertia of the world and allow for true creative acts to take place. It also aims to provide a vision of Nordic policy and of a eurocultural remedy to counter the risk of intolerance among politicized narrowmindedness that threatens to degenerate the potential dimensions of value in the life of modern society. For the development of a critical dialogue across disciplines, and across science and the arts in society, take a look at the Arescope website. 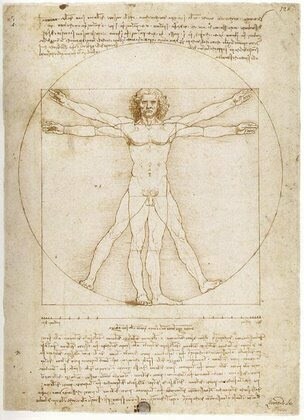 Leonardo da Vinci, The Man, 1492. We search for ways to reintegrate human values in science and society, through the arts as a great integrator or medium of transforming experience. We like to learn from the great masters some of the best models of transcience and transcendence in thinking and feeling in the process of understanding and improving the world. Leonardo's "renaissance man" stands as an icon for the ancient tradition of the classic elite, challenging a narrow Scandinavian taboo. Read more about about the current "Arelites". (*) The Arelites were an archaic tribe in the genealogy of the Bible (Old Test. 26:17). Under the assumption of contextuality our modern interpretation of "ar" (one of its ancient connotations was 'water') refers to artistically creating the future by knowing your tradition, reconnecting to your origin and finding your deeper self well anchored alike. A motto indicates our devotion to the good of all others (Gr." panta pasis areskou"). intends to develop an alliance for strategic cognition and foresight research for creative and entrepreneurial excellence in value-focused knowledge and competence integration in a Nordic and European arena. Its aims include the promotion of societal maturation and quality of life. It relies on the experience of historic models of human dignity to achieve its defined goals. It relies on the mobilisation of a passion for helping people in need - in order to assist and support in developing their capacity to love, live and act in consent with (and concern for) others and to contribute to a shared future on our globe. A key ambition is to work for and motivate valuable human exchange and social interaction while providing tools for the integration of available high competence in governance to improve the quality of decision-making (in the areas of its collegiates). This work is devoted to a bettering of a meaningfulness in life and to help securing sufficient access to the richness of our cultures to ensure in particular the psychosocial health of children and the young of our next generations. The presentation of the work is both in the form of internal consultations and in medial presentations which use the arts and aesthetics to enhance the message and reach people's hearts. THIS WEBPAGE IS IN PROGRESS. IT WILL IN DUE TIME PROVIDE INFORMATION ON THE HISTORY, ACTIVITIES, PROGRAMS AND PROJECTS OF ARE AKADEMI. YOU ARE WELCOME TO REVISIT THE SITE. THANK YOU FOR YOUR ATTENTION AND FOR YOUR PATIENCE. © 2000-2014 ARE AKADEMI Collegium Europaeum (for all pages on site). Unless otherwise noted, all rights are reserved for the entire website with all its intralinks of which the organisation holds copyright. No part of therein contained documents may be reproduced, copied or distributed without the express written consent of the author (to be contacted at coleur @ gmail.com for license agreement and compensation). Single printouts only for non-profit use such as personal self-study and research purpose solely is encouraged. Opinions expressed to foster public dialogue may not be identical to the view of either the organisation or its founder. Date of publication of first page: Stockholm, April 5, 2007. Materials including music and other media or forms of interart published and made publicly available on or through this website remain (unless otherwise indicated) the copyright of the respective rightholders such as authors, artists, composers and performers or inventors, patent holders and producers according to in first instance European (EU) legislation valid and adopted in the nation of Sweden. Projects or parts thereof presented on this website have been sponsored by foundations such as The Bank of Sweden Tercentenary Foundation, Torsten och Ragnar Söderbergs Stiftelser, and Ruben Rausings Fond för forskning om nyföretagande och innovationer, Sveriges Författarförbund, and others listed in due place.